Martin Weinstein, a former trial attorney turned photography connoisseur, has given more than 500 photographs to the MIA, in addition to numerous prints, paintings, and sculptures. 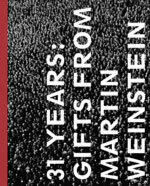 “31 Years: Gifts from Martin Weinstein” celebrates the depth and quality of his decades of art giving. The photographs on view include a who’s who in the history of photography, from Margaret Bourke-White and Ansel Adams to Robert Mapplethorpe and Alec Soth. Together these pictures highlight many stories—personal, institutional, and historic. One story, outlined in the accompanying catalogue, centers on the late Carroll T. Hartwell (known as Ted), the MIA’s founding photography curator, and his long-standing friendship with Weinstein. This exhibition is organized by the Minneapolis Institute of Art. Generous support provided by Maslon Edelman Borman & Brand, LLP. Additional support provided by Michael Snow, Donna and Jim Pohlad, Walt McCarthy and Clara Ueland, Doug Pugh, and Mary and Bob Mersky.